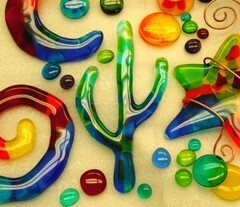 Make your own colorful custom fused glass nuggets, saguaros, stars, moons, etc. in this fun 2 hour class. All glass and kiln firings are included in class fee. Wire wrapping, shown in picture, is only a suggested use and is not included in this class. Sign up for Sun Jewels or Wire Wrapping classes to use your Sun Drops in a creative way.